About eighty years ago, the 1930s were very hard times in the USA. First there was the financial crisis with the 1929 Wall Street crash. 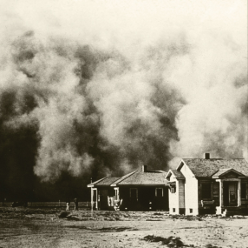 Then there was an environmental crisis called the Dust Bowl due to inappropriate soil management with the industrialisation of agriculture. Add to this the fears over the future of democracy as dictatorships were rising in Germany, Italy and Russia. Woody Guthrie wrote many songs in that period and about these issues. You can read an interesting article about it, and in particular he wrote the song Better World A-Comin' during the war. Today I thought I'd sing along, with a contemporary note. How does that compare with today's situation? While some regulatory measures might have been put in place since then, finance and speculation are still posing a threat on the world's economy. The last evidence of this was in 2008. Then you don't have to go to Alaska or Africa to measure the effects of the rapid changes in the planet's climate, this is even worse than ten years of dust through the North American plains and we may well now be entering a global Toxic Bowl. Finally, democracy and peace are also under threat with nationalist political parties rising again in Europe as well as in America, not to mention the established dictatorships and fanatic organisations in many places around the world. Art in its widest sense is the real essence of humanity. Let's not lose hope but try to find creative ways to build a better world together, even if it takes forever. America's Town Meeting of the Air welcomes you to historic Town Hall in New York City. Which is today the power in Europe? Which is the strongest? They must obey or go to a concentration camp. Can you imagine? What does the public want in music? Radio noises partly recorded by me with an old valve radio and partly found on freesound.org. Special thanks to Banjo Nick from Cambrige for the banjo bits, samples from a Spare Wednesday session at the 6 Bells. The Dust Bowl photo comes from the U.S. Department of Agriculture.